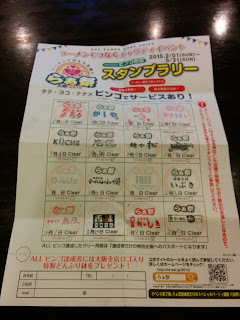 With under one month left until the Osaka Ra-sai Stamp Rally was over, I was aiming for all the ramen shops in far locations I don't usually make it to. Next up was Moriguchi's own Menya Shiki, a shoyu place that is just about the only thing around Moriguchi Station. I got out, went in, and ordered the Shikimen. I got a bingo on my scorecard here, so I got a free few pieces of chicken chashu. A brown mixture of medium-rich soy sauce broth, along with a healthy mixing of anchovy. The broth was good, and the curly, chewy noodles, were too. There was an anchovy on top, too, a small and crunchy delight to drive home the theme. The pork was alright if a bit over-salted, but the simple seared chicken and crunchy rope of menma lightened up the dish. I would if I'm out there again. If you're in the area, you should stop by. When did that happen? Only two left!